10:45pm: The Orioles and Yankees have formally announced the trade. Baltimore assigned Tate to Double-A Bowie. Rogers and Carroll have been assigned to Triple-A Norfolk. 8:01pm: The Zach Britton bidding war looks to have come to an end, as the Yankees have reportedly reached an agreement to acquire the left-hander from the Orioles in exchange for minor league pitchers Dillon Tate, Cody Carroll and Josh Rogers. The reported agreement has yet to be announced by either club and is said to still be pending medical reviews — a major final hurdle to clear, especially when considering Baltimore’s previous history of nixing or delaying deals over medical concerns. If the trade is ultimately finalized and announced, the addition of Britton would boost an already overpowering Yankees relief corps that features the likes of Aroldis Chapman, David Robertson, Dellin Betances, Chad Green and Jonathan Holder. Each of those relievers has thrown at least 40 innings in 2018, and each has an ERA of 3.05 or better. All but Holder (7.9 K/9) have averaged 10.9 strikeouts per nine innings or better. 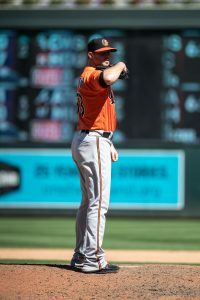 While he doesn’t quite look to be back in peak form after this offseason’s surgery on his Achilles tendon, Britton has made significant strides over his past eight outings in terms of both velocity and ground-ball rate. His control isn’t quite back up to its peak levels, but Britton is missing bats and racking up ground-balls at a 72.2 percent clip over eight straight scoreless appearances. If healthy, Britton will give the Yankees a potentially dominant second lefty to pair with Chapman and the Yankees’ slew of top-notch right-handed arms. That’s been a missing piece for New York all season, as Chasen Shreve has been solid at times but largely inconsistent. A free agent at season’s end, Britton is earning $12MM this season and is still owed about $4.38MM of that sum. That money would count against the Yankees’ luxury tax ledger, though the they’re currently a bit more than $15MM south of the $197MM barrier, so Britton won’t push them over the edge. His addition will inch them closer to that mark, which will need to be a consideration in further trades, but for the time being, they’re still well clear of penalization. Because Britton will be changing hands in a midseason deal, he won’t be eligible to receive a qualifying offer at season’s end, meaning the Yankees won’t be able to recoup any draft-pick compensation if he departs and signs elsewhere as a free agent. That’s barely a consideration for the Yankees, though, as they find themselves six games back from the Red Sox in the American League East. While the Yankees are hardly out of contention for a division title, it looks considerably likelier right now that they’ll find themselves in an American League Wild Card showdown against the Mariners or the Athletics. Adding another potential shutdown reliever to an already formidable bullpen will aid rookie manager Aaron Boone’s efforts to shorten the contest and provide the Yankees insurance in the event of an unexpectedly short start, such as the one they received from Luis Severino in last year’s Wild Card game against the Twins. Furthermore, it’s become increasingly common for clubs to stack their bullpens with potent relievers as a means of shutting down opposing lineups in postseason series. The Astros, Cubs, Royals, Indians and Dodgers are among the teams that have enjoyed deep playoff runs in recent seasons with stacked relief units that can be relied upon more heavily in the postseason than during the regular season thanks to the built-in off days during the playoff schedule. Britton only furthers the Yankees’ ability to employ that tactic, should they ultimately return to the ALDS for a second consecutive season. Turning to the Orioles, they’ll bid adieu to fan favorite in Britton — a longtime top prospect who floundered as a starter but emerged as one of the best (if not the best) reliever in baseball at his peak with the club. Britton anchored the Orioles’ bullpen in both 2014 and 2016, helping the team to the postseason in each of those two campaigns — even if he’ll be more remembered for manager Buck Showalter’s stunning decision not to use him in the 2016 Wild Card tilt against the Blue Jays. He’s the second star the O’s have shipped out in recent days, joining Manny Machado as Baltimore looks to restock a decrepit farm system that has long ranked among the worst in the game. The top piece joining Baltimore’s minor league ranks is the 24-year-old Tate — the fourth overall pick in the 2015 draft. While Tate was originally selected by the Rangers, they subsequently traded him to New York a year later as the main piece in the Carlos Beltran swap. Tate was struggling at the time of that deal and had seen his prospect star dim a bit, but he’s rebuilt much of his stock with the Yankees and is currently in the midst of a quality season for the Yankees’ affiliate in Trenton. Through 82 2/3 innings, he’s worked to a 3.38 ERA with 8.2 K/9, 2.7 BB/9, 0.76 HR/9 and a 48.1 percent ground-ball rate. Baseball America recently ranked Tate as the Yankees’ sixth-best prospect on its updated Top 10 rankings for the organization, praising his “high-end stuff” and crediting him with the potential for three plus pitches (fastball, slider changeup). He still needs to be more consistent with his secondary offerings, per BA’s report, but Tate will give the Orioles a much-needed potential mid-rotation starter on which they can dream. Carroll, 25, ranks 15th among Yankees farmhands per Jim Callis and Jonathan Mayo of MLB.com, though they’ve yet to publish their midseason update of the team’s rankings. That said, Carroll hasn’t done anything to lower his status in 2018. To the contrary, he’s been nothing short of brilliant out of the Yankees’ bullpen in Triple-A. Over the life of 41 2/3 innings, Carroll has logged a superlative 2.38 ERA with 11.9 K/9, 3.9 BB/9 and a 32.6 percent grounder rate. He’s been fortunate in that he’s yet to surrender a home run this season, so his ERA should probably be taken with a grain of salt, but Callis and Mayo slapped a 75-grade on his heater (on the 20-80 scale) in their free scouting report, and Carroll’s slider also draws plus ratings. The 24-year-old Rogers, meanwhile, doesn’t rank among the Yankees’ top tier of prospects, but he’s worked to a 3.95 ERA with 6.8 K/9, 2.4 BB/9, 1.07 HR/9 and a 40.1 percent ground-ball rate in 109 innings (19 starts) for the team’s top affiliate in Triple-A Scranton/Wilkes-Barre so far in 2018. Given his age and relative success in the upper minors, it’s conceivable that he could help the Orioles as soon as the second half of the 2018 season. If not, it’s likely he’ll be viewed as an option to join the staff in 2019. As for the Yankees, they’re still quite likely to be in the market for a starting pitcher. The fact that Tate is the headliner of the return for Britton subtracts one of their better chips, but the Yankees nonetheless possess a deep farm system that should allow them to pursue virtually any starter on the market — be it a major upgrade with multiple years of control remaining or a short-term rental with a decidedly lower cost of acquisition. The Britton trade, then, will likely be the first of many for the Yankees in the coming week (to say nothing of August) as they gear up for yet another postseason appearance. Ken Rosenthal of The Athletic first reported (via Twitter) that the Yankees had emerged as the front-runner for Britton and that Tate had been scratched from his start. SNY’s Andy Martino tweeted that the two sides had reached the medical review stage of talks. Roch Kubatko of MASNsports.com tweeted that the Yankees would send three prospects back to the Orioles. Fancred’s Jon Heyman reported that the two sides had agreed on all of the players to be involved, pending medicals (Twitter links). Joel Sherman of the New York Post reported that Rogers and Carroll were in the deal (Twitter links). The Rangers have officially announced the signing of fourth overall pick Dillon Tate, along with the signings of righty Jake Lemoine (fourth round), shortstop Dylan Moore (seventh), righty Blake Bass (eighth), righty Peter Fairbanks (ninth), shortstop Leon Byrd (tenth), and centerfielder Ledarious Clark (12th). All have been assigned to short-season Spokane except Lemoine, who will head to the Arizona Summer League. Tate will receive a bonus of $4.2MM, as Anthony Andro of FOX Sports Southwest tweets. The pool value of the pick was $5,026,500, so Tate’s signing will save the Rangers over $800K that they can use on later picks, perhaps including third-round pick Michael Matuella, who could command a bonus above his recommended $777,600 allotment. Lemoine, meanwhile, will receive $528K, which is the exact bonus allotment for his pick. Tate, a 21-year-old junior righty from UC-Santa Barbara, earns high marks for his fastball (which can reach up to 98 MPH) and high-80s slider. MLB.com notes that his curveball isn’t as strong and that his delivery involves a bit of effort, but that Tate seems to have answered questions about whether he’s capable of starting. If in fact he doesn’t work out in that role, his arsenal would seem well suited to bullpen work — Tate excelled as a closer in college before transitioning to the rotation. Baseball America (subscription-only), meanwhile, ranked Tate the No. 3 prospect in the draft, behind only Brendan Rodgers and Dansby Swanson. BA noted that, as a result of switching from relieving to starting, Tate greatly increased his innings total this year. That might mean the Rangers could be cautious with him as he enters his first pro season. Tate has pitched 103 1/3 innings so far in 2015, with a 2.26 ERA, 9.7 K/9 and 2.4 BB/9.